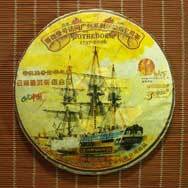 The full name of this tea is actually Ge De Bao Hao Fang Wen Guang Zhou Li Xie Shu Bing Cha, which means "Commemoration of Gotheborg's visit to Guang Zhou; Cooked Pu'er Tea Cake". The tea leaves are harvested from Bu Lang Shan, one of the highest mountains in Simao areas in Yunnan province. We highly recommended this tea cake to collectors not only for its beautiful wrapper painting, but also because the production of this tea cake is limited to 30,000 pieces only. This review was done in December of 2015, so adequate time for aging. This tea displays a unique non Pu´re taste with a mildly bitter green tea leaf flavor. The bitterness is in the background and is not overpowering, but present and lingers with a slight aftertaste. 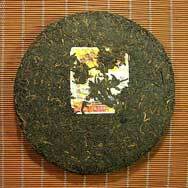 The classic Pu´re aroma is absent, replaced with a light green tea scent. Overall pleasant, and drinkable. Will be most appreciated by green tea enthusiasts´ and those that find a classic Pu´re taste less attractive. Nice bakey, leathery aroma. 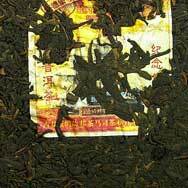 Has the interesting, clean flavours of its sister, the Menghai shu, but is richer, sweeter, fuller. Really, this is a great buy and a worthy match for the Ge De Bao Sheng.